Why did hundreds of young Channel Island women cross the sea to train to teach in Salisbury? From the first student who arrived by paddle steamer and stagecoach in 1843 to the last ones in the 1970s, we tell their stories, including the dark days when the Islands were occupied by German forces during the Occupation in the Second World War. The students' stories reflect how life changed as communications improved and education advanced. ​We Will Teach! has stunning photographs and illustrations. 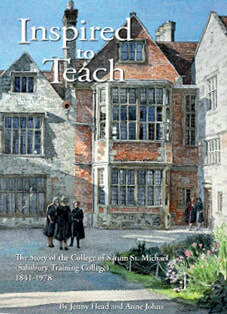 ​Inspired to Teach is a fascinating insight into the life and history of The College of Sarum St Michael (formerly Salisbury Teacher Training College) in The Cathedral Close 1841 - 1978, by Jenny Head and Anne Johns.